Retractable awnings are a great investment that are becoming increasingly popular for shading needs. Retractable awnings are a great option for any of your shading needs. While awnings provide shade that can provide cool shade in hot weather, protection from ultraviolet (UV) rays, and even advertising for commercial businesses, there a number of reasons to choose a retractable shade structure for your awning. Retractable awnings are a great investment that are becoming increasingly popular for shading needs. Here are 3 big reasons to invest in retractable awnings. Awnings protect your windows and doors from sunlight. Harsh light can cause your furniture or art to fade, and shading your windows or doors can help prevent this. This shade can also help you better enjoy your outdoor spaces, whether you want to sit out on a porch or patio or simply walk in shade along the windows. By shading the area with a retractable awning, you can reduce the temperature and protect guests from harmful UV rays. With an awning, you can even protect yourselves from UV rays that come through the windows by shading the sources of natural light in your home or business. Retractable awnings are some of the most versatile and customizable shading systems on the market. You can choose your shading structure’s size, retracting mechanism, and shape based on your needs. You can even use a customized awning with your business name or logo featured prominently to help attract foot traffic to your business. 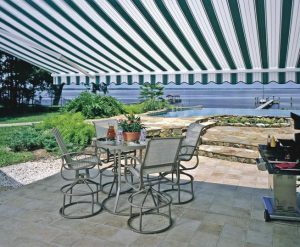 Or, you can choose an awning material that works with your home’s unique style. Considering how simple retractable awnings are to open and close, you can also store them neatly when not in use, allowing you the freedom to enjoy the shade or the sunlight. Lastly, retractable awnings require simple care. This makes them ideal for cleaning, maintenance, and even storage through the winter. With the ability to retract your awning, you can easily protect it from harsh weather, strong winds, and heavy snow buildup that would normally damage your awning. Plus, their retractability makes them easy to remove for routine cleaning or simple repairs. You can even replace the awning material on your structure more easily when you’re able to retract your awning without taking apart the whole shade structure. Just be sure to waterproof your awning to make sure it stays well-maintained.